The true spirit, roots, and flavors of regional Mexican cooking�from Puebla, Mexico City, Michoac�n, the Yucat�n, and beyond--come alive in this cookbook from Gonzalo Guzman, head chef at San Francisco restaurant Nopalito. Inspired by food straight from the sea and the land, Guzman transforms simple ingredients, such as masa and chiles, into bright and flavor-packed dishes. 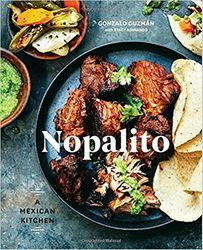 The book includes fundamental techniques of Mexican cuisine, insights into Mexican food and culture, and favorite recipes from Nopalito such as Crispy Red Quesadillas with Braised Pork and Pork Rinds; Toasted Corn with Crema, Ground Chile, and Queso Fresco; Tamales with Red Spiced Sunflower Seed Mole; and Salsa-Dipped Griddled Chorizo and Potato Sandwiches. Capped off by recipes for cocktails, aqua frescas, paletas, churros, and flan�Nopalito is your gateway to Mexico by way of California. This is a cookbook to be read, savored, and cooked from every night.